For two hours, the two villages located near the popular Matana Beach Resort, suffered the brunt of TC Keni. 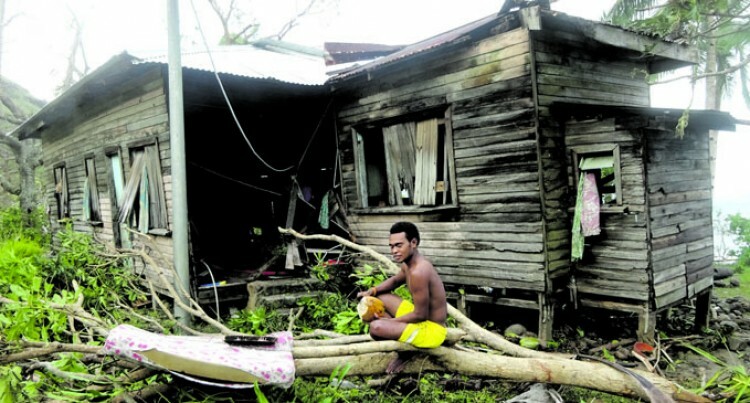 Tidal waves and category three winds from Tropical Cyclone Keni damaged several homes in Drue and Navuatu villages in Kadavu. At least 10 out of the 27 houses are now without roofs and walls at Navuatu Village. Village headman, Maciu Cava Naivakadranu said the wind and rain picked up at the forecasted time of 3pm. “The last time something like this happened was in 1959. I remember as a young boy, we had to run up to the hills,” he said. He said the tidal waves were at least eight feet high before they crashed onto land and destroyed homes located on the beachfront. The waves travelled close to 100 metres inland. Mr Naivakadranu lost his boat, the village boat and both their motors. Despite the damage, he said the villagers heeded the advice from the Met office and were at his place which was used as an evacuation centre. “I made sure that at the height of the cyclone, I left a door open to ensure that the wind flowed in and out freely,” he said. In a video sent in by Australian tourist, Paul Bosio, Drue Village headman Josese Tuira is seen standing in front of a collapsed building. He said the building was destroyed by the tidal waves. “It only took three waves to destroy the building. This building is not even a year old,” Mr Tuira said. “For those in their twenties, this would be the first time for them to witness something like this. Clean-up started yesterday with villagers keen to get their lives back to normal. Drue Village School headteacher David Tuirabe confirmed that the school dining hall was completely destroyed. “Most of the teachers quarters were damaged and two classrooms are partly damaged,” Mr Tuirabe said. He said they would survive on whatever is left in their cupboards over the next few days. Drue and Navuatu villages are separated by a church but located close to each other. Matana Beach Resort is a popular diving spot for tourists. It is located near Navuatu Village. The village is only accessible by boat. On foot, it takes an hour to get to the Vunisea Government Station.